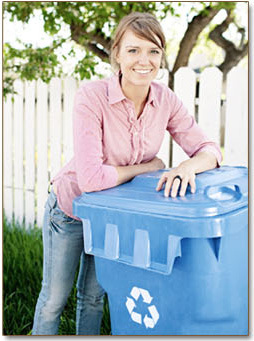 Looking for recycling and composting guidelines? Here are the services, guidelines, maps, tools—everything you need to reach your own 80% goal (or better!) to help keep materials in the production loop instead of having to deplete more of our natural resources to make new products. WATCH the new optical sorter in action at the Boulder County Recycling Center! 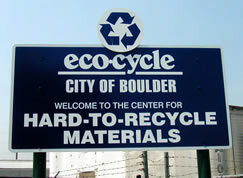 The Boulder County Recycling Center, owned by the county and operated by Eco-Cycle, recently completed state-of-the-art upgrades, allowing more plastics to be recycled than ever before. 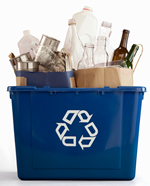 Some new recyclables, accepted in all curbside single-stream recycling bins, include plastic "clamshell" containers (like berry containers) and take-out containers, rigid plastics like 5-gallon buckets (handles are OK) and plastic lawn toys (remove metal axles; materials MUST fit inside your bin), and plastic dairy and hummus tub lids. Eco-Cycle’s Green Star Schools®Program: These Boulder County schools are the first in the nation to reduce waste in every aspect of school life.